My Life With Monkeys: Friday Happy Hour: It's Your Turn! It’s finally the end of the week. Finally Friday. It’s time to shed the week’s work and take a breather. If you are just joining this regularly scheduled post, I have to inform you that it is less about half price well drinks and more about celebrating a happy life. You see, for me, it’s always “the best week ever” no matter what the week brought. Some weeks this is not an easy task, but I drive on with purpose because I know there is only one way to look at the days I have been given. Attitude is everything. 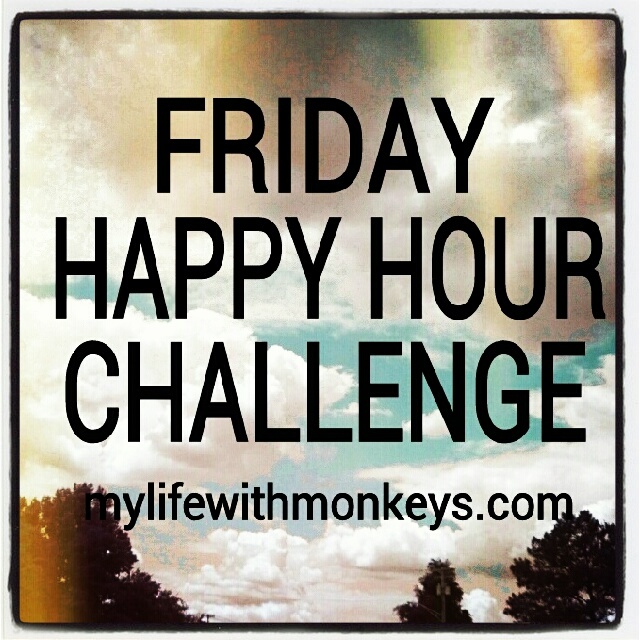 Find great examples of Friday Happy Hour Posts of the past HERE or HERE or HERE. Today I turn it over to you! Today I am asking you to do more than read my thoughts every Friday, but start staking your claim in a happier life with this one simple action: Take the Friday Happy Hour Challenge with me and see if you can’t make every week the best week ever, too. Breathe. Take a big breath and let it all go. You know, the frustrations, the disappointments, the things that got you riled up and anything else that did not serve you well. Go on, take a second breath if you have to! Reflect. This is the moment when you review all the big and little things that made you smile this week. Some weeks we have to look harder than others. Do you need to meditate? Pray? Go for a run? Listen to music? Take a nap? Employ whatever method works for you, but now is the time to focus on what really matters in your life. I have no doubt that something good happened this week! Write. Now you get to make a list. The physical act of writing down all the wonderful things in your life can transform the way you think. There it is staring right back at you – proof positive that something good happened. Irrevocable evidence that you are having the best week ever. Are you having a challenge looking for the positive? If you are stuck, here are a few questions you can ask yourself to fetter out those important moments? · Did you share a meal with someone and enjoy either the meal or the company? · When did you laugh? A funny show or commercial? Your pets (kids) acting silly? · Did you look up at the sky and wonder? Big clouds, stars, a full moon, a sunset? · What task did you cross of your list that relieved your burden? Pay a debt? Clean a toilet? Write your novel or paint a masterpiece? · Who did you take the time to help? · When did you learn something new? In the news, in a book, about a loved one, at an event, on the radio, etc. · Where did you go and what did you see? Repeat. Now do it every week. You’ll notice before long that you are making the list before Friday ever arrives. That it becomes second nature to look at every week as the “best week ever” because it serves you well to be a positive thinker. So, are you in? Will you have the BEST WEEK EVER? Are you going to take the FRIDAY HAPPY HOUR CHALLENGE with me? I’m so excited to have you onboard and I hope you will connect with me on FACEBOOK because I’d like to know you better. And I hope you SHARE this message with your friends and family. They’d like to have a better week, too! I do have a gratitude journal but sometimes I just need a kick in the bum (or a challenge) to remember to use it more often. I really like your Blog Mood! Thank you Kelle, you are an inspiration! "Diane!" from the other side of the house. "Can you help me find my glasses?"